Cryotherapy is a minimally invasive treatment in which the prostate gland is frozen under real-time ultrasound guidance. This radiation free technology has been in use in the United States since the 1960s and the ability for ice to kill prostate cancer cells, regardless of their Gleason score, has been well documented. 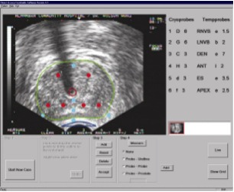 This technology was modernized over 10 years ago incorporating computerized treatment planning, smaller needles that utilize Argon to deliver cold temperatures to the prostate, and improved ultrasound visualization. Small cryoneedles are placed through the skin in the perineum under ultrasound guidance. Argon gas creates an iceball at the end of each cryoneedle. The actual pattern of needle placement determines the size and shape of the ice ball. A warming catheter protects the urinary channel (urethra) from freezing. The use of cryotherapy in the treatment of primary prostate cancer or radiation recurrent prostate cancer is well established in the U.S. and is incorporated into current NCCN (National Comprehensive Cancer Network) guidelines. Cryotherapy is an outpatient procedure in which a series of small needles are placed through the skin in the perineum and directly into the prostate under ultrasound guidance. A computerized cryotherapy machine passes Argon gas through the needles resulting in the creation of very cold temperatures within the prostate. The cryotherapy needles can be placed in very precise arrays enabling me to accurately control the location and amount of ice within the prostate. The urinary channel is always preserved by means of a warming catheter. My patients are discharged from the same day surgery unit at the hospital within a few hours of completing the treatment. A urinary catheter is required for approximately one week. 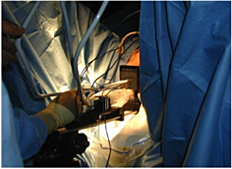 However, my patients are able to return to full activity once their catheter is removed. 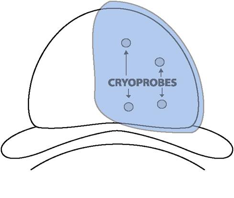 Cryoprobes can be placed to freeze only a portion of the prostate. The Scionti Prostate Center is highly experienced in Focal Cryotherapy treatment. The ideal patient for cryotherapy has a normal sized prostate and localized prostate cancer. One of the advantages of cryotherapy is that it is possible to freeze as much or as little of the prostate as necessary depending upon the extent and location of cancer within the prostate gland. Therefore, focal therapy is possible using cryotherapy. There been many published studies on cryotherapy, which have demonstrated similar effectiveness to radiation therapy. Total gland cryotherapy can produce significant risks of erectile dysfunction, however, the risk of urinary leakage is very low. I’ve been performing cryotherapy now for over 14 years and have completed nearly 1000 procedures. NOTE: Cryotherapy is an accepted treatment for prostate cancer and is covered by Medicare and all commercial insurances in the United States.